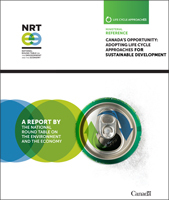 Ottawa – May 16, 2012 – The National Round Table on the Environment and the Economy today released a new report – requested by the Minister of the Environment Peter Kent – that identifies the need for Life Cycle Approaches in environmental and economic decision-making by companies and government. A Life Cycle Approach is a systematic way of looking at the life of a product, technology, or process. By identifying and understanding the inputs and impacts that exist throughout life cycles, we are better able to measure and reduce associated costs to our economy and environment. Canada’s Opportunity: Adopting Life Cycle Approaches for Sustainable Development sets out risks faced by Canadian companies to comply with increasing foreign government regulations and emerging market demands that require product life cycle disclosure and stronger environmental standards. Foreign governments are already imposing requirements on the content of goods sold in their jurisdictions – such as standards for renewable fuel content in transportation fuels. Using resources efficiently — from extraction to disposal — is no longer a simple matter of local determination; it is increasingly a matter of global importance. Life Cycle Approaches support environmental stewardship by compelling firms to increase efficiencies in their production processes and internal operations, and consider environmental factors in their decision making. There are clear opportunities for companies that take this route and adopt a Life Cycle Approach to achieve better supply-chain performance, internal operation efficiencies, and increased institutional capacity that enhances innovation. The EU and its member states are leading the way in the use of Life Cycle Approaches in public policies and programs, while other countries have adopted aspects of this approach, including Japan and the U.S. In the last decade or so, Canada has not actively pursued the development and implementation of policies and programs based on Life Cycle Approaches in a coordinated manner or to the same extent as leading countries. Focus has mostly been on reducing product waste and disposal which is just one aspect of Life Cycle Approaches. At present, Canada has no life cycle information database accessible by government and business, little interaction to date between governments and industry on trends and needs, and no real support for businesses seeking to excel and be competitive in this area. Support for applying Life Cycle Approaches across federal government departments is scattered and uneven with no designated centre of expertise or responsibility. Here in Canada, the private sector is in front of government in considering and applying Life Cycle Approaches. “Europe and the United States are further ahead in the mainstreaming of life cycle applications, which should act as a driver for action here in Canada too. It is our belief that there is nothing more critical to enabling the “step change” toward sustainability, for businesses big and small, than creating a collaborative, pre-competitive approach to life cycle deployment.” said David Smith, Vice President, Retail Strategy, Sobeys Inc.
Canada’s Opportunity sets out the NRT’s proposed course of action for moving ahead on adopting Life Cycle Approaches to sustainable development in a comprehensive and consistent way. Federal government leadership in the application of Life Cycle Approaches to its own internal operations and policy decision making. The report has been sent to the Minister of the Environment for his consideration and is available with the NRT’s formal letter to the Minister on the Round Table’s website: www.nrt-trn.ca.